Basically sambal is sauce made from chili as the main ingredients. Indonesian serve sambal as dressing of all kind of meats, seafood, salad and as building block to spice up soups, stir fry dishes, stew, etc. 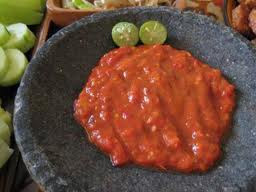 Sambal is very versatile dish and a must in almost every family table. There is wide variance of sambal in Indonesia since every ethnic groups have their own preference of cooking. In this lens, I would like to share some Indonesian style sambal recipes. Its simple and easy to make. Try garlicky, spicy, lemony, full of flavor, fiery kick and mouth tingling Indonesian sambal. Its really appetizing. Share these recipes with family and friends. Take your cooking adventures to the next level with sambal. Enjoy..